Starts with You. Right Now. Let Scott Fox help you and your business. Internet Pioneer, Author, Entrepreneur, Business Strategist, Startup Mentor, Angel Investor, Podcaster, Nice Guy. Scott Fox is dedicated to helping people just like you to get their share of the Internet revolution. A best-selling author, his message of DIY internet entrepreneurship has reached millions worldwide through his books, podcasts, speeches, YouTube videos, and years of radio and press interviews. How can Scott Fox help YOU? Who is Scott and what is his mission? Why does he write books and give the profits to charity? What qualifies him to give advice about startups, lifestyle business design, and business strategy? 3 best-sellers (so far!) dedicated to bringing the profits of the Internet business revolution to you. Audio, Kindle, and foreign language translations are available worldwide. Talk privately by phone with Scott Fox to help develop your business ideas and advance the growth of your ventures. You'll get to speak directly with Scott, so limited calls are available each month. Learn more and book your Private Coaching Call here. Work directly with Scott Fox in the #1 MasterMinds Coaching Forum online. For beginners, intermediate, and established entrepreneurs and small businesses who want to accelerate their success. Since 2009! Get a great FREE TRIAL deal here. Join Scott's FREE EMAIL LIST here. Just share your email address to get 2 helpful free ebooks instantly: the FREE "Niche Business Identification Checklist", and his "Website Startup Checklist", plus updates and more! Trying to raise money for your startup but you have questions about what to say, how to say it, or maybe English is not your first language? Why not have former startup CEO, investment banker, attorney, and serial entrepreneur Scott Fox personally review your business idea, business plan, investor presentation, or other materials? Learn more about how you can get Scott's experience on your side here. Here are the services you should use for hosting, web design, publicity, logo design, strategy coaching, domain names, and all the other tools your business needs. Whether you are new to building websites or an experienced pro, these recommendations can help your business. Website need help? Easily improve your website design, usability, SEO, and sales conversions with a friendly, customized video review of your website from Scott. If your website isn't delivering the sales or traffic you want, it's time to get an expert to review it for you. You'll get a personalized review guaranteed to help your business. Learn more and order a video review to help improve your website here. Click to visit Barnes & Noble! Visit Scott Fox's Author page on Amazon.com! Have you read any of Scott's books? Take this quick survey to earn a BUNCH of valuable FREE bonuses that can help you build your Internet business. 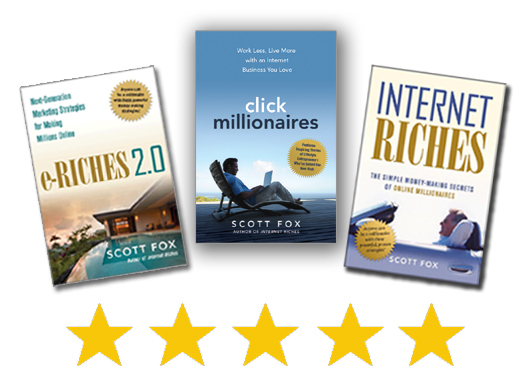 Whether you've read Internet Riches, e-Riches 2.0, or Click Millionaires, your feedback would be appreciated. And, I'll thank you for your time with 5 free bonuses just for my readers like you here. Join Scott's free email list!